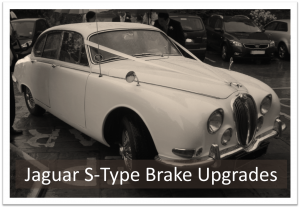 During its life the S-Type received improved brakes as Jaguar moved away from the use of early Dunlop brake systems and installed the improved Girling calipers. However, all the brake discs on the late model S-Types remained solid. Even the newest S-Types are now over 40 years old and the efficiency of their brakes is often below expectation. To help rejuvenate the stopping power of the Girling brake equipped cars Fosseway Performance has a number of S-Type brake upgrade kits to improve their brakes. As with all of our brake upgrade kits, the S-Type options can be installed without permanent modification to the car. The calipers are carefully sized to ensure they remain compatible with the existing brake master cylinder and servo assembly. All kits are supplied with braided stainless steel brake lines.